Scrum Sevens wanders down memory lane and celebrates seven examples of Pacific Islands magic. There's upsets, huge hits, clean outside breaks and nose-to-nose dancing. 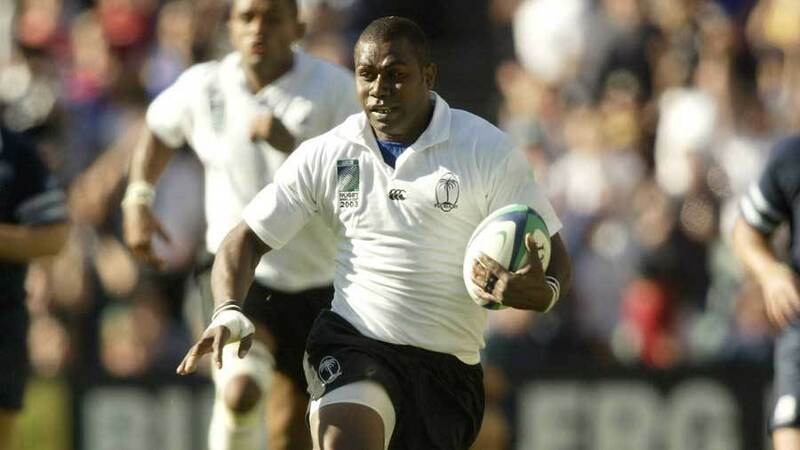 Besides having one of the most natural nicknames in the sport, Rupeni "Caucau" Caucaunibuca was all too briefly one of the most feared widemen in rugby. Caucau burst to international recognition with two simply scintillating finishes against Scotland at the 2003 World Cup in Sydney. The term 'low centre of gravity', didn't quite do the Fijian speedster justice. At times he seemed so close to the ground that you'd have believed he was on his knees but he was built like a rock; stocky, squat, barely up to most modern wingers' waist. But boy could he fly; just ask Scotland's back three that day. Caucau's first try came from nothing. Nicky Little sent the ball through the hands with little urgency before it found its way to Caucau on the left wing via an unflagged but blatant forward pass. And thank the heavens it wasn't called because Caucau just set off for the line from 25 yards out: zero to 60 in the blink of an eye, with Glenn Metcalfe and Kenny Logan flailing away and Simon Danielli diving out too soon. It was hard to believe it could be bettered, but it was before the half was out, Caucau picked it up on his own 22 and just let rip. Replacement James McLaren was stepped with ease and Metcalfe simply beaten for pace. You know the rest. Fiji couldn't quite grab the win but rugby had a new star. The Cardiff Arms Park was a sea of red on October 6, 1991 but it'll be remembered as one of the blackest days in Welsh rugby's proud history as they were downed by tiny, unfancied Western Samoa. Little was known about the Western Samoans in their first World Cup but they had a talented line-up containing Pat Lam, Frank Bunce and Brian Lima (more of him later…). At the time, the country had little more than 2,000 players. Wales were played off the park by a side that tackled hard and played with freedom as it ended 16-13. To'o Vaega produced a glorious chip and chase to score Samoa's first (although the grounding was suspect), while Sila Vaifale nabbed another. The aftermath of the game gave rise to one of rugby's great quips as one wise chap said 'thank heavens Wales weren't playing all of Samoa!' By the time Samoa won again in Cardiff in 2012, Wales were playing the whole country. In 1991 it was one of the great sporting, let alone rugby, upsets. It's hard to think of a more topsy-turvy World Cup campaign than France in 2011. The history books will tell you they lost the final by a point against the home nation and world No.1 but it was nowhere near as simple as that. Their advancement from the group was only actually confirmed by a bonus-point try from Vincent Clerc in the final minute of their final pool game against Tonga, who had a fair right to feel robbed. Tonga won the game but should have joined Samoa in the knockout stages. To do so, they needed a four try bonus-point. But Clerc, and their own wastefulness, conspired to ruin their moment. They scored a try of their own but squandered at least four more and this is likely to be remembered simply as a rung on France's extraordinary rise to the final. Instead it should be remembered as another wonderful Islander win. So far, just two Pacific Islanders have been inducted into the IRB Hall of Fame. One, Waisale Serevi, is the greatest player rugby sevens has seen. The other, Brian Lima, is one of the greatest (if not the best of all) tacklers any code has seen. Lima played at five World Cups, which is quite extraordinary in itself, but even more so when you consider the way he threw himself about on the field. He cared not for his own safety, or that of his opponents. He was the youngest player at the 1991 World Cup and went on to play 64 times for Samoa and is their most capped player ever. Unsurprisingly, he's a national legend. But Lima's international fame was secured with the advent of YouTube. Now, fans the world over can marvel at the ferocity of the hits of the man they called 'the chiropractor'. Famous victims included South Africa's Derick Hougaard, Mirco Bergamasco (in a charity match - Lima shows no mercy) and Jonny Wilkinson, who copped a spine-tingler in Lima's last ever match. 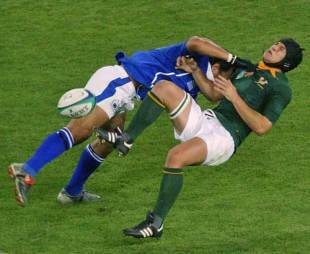 Most of those with just a passing interest in rugby believe that there's just one war dance in the game. Oh, how they're missing out. The Pacific Islands all throw the gauntlet down with their own intimidating pre-match challenge. The Samoans have the Siva Tau, the Fijians the Cibi, while the Tongans do the Sipi Tau. All are a sight to behold but it was the last of these that caught the headlines by clashing spectacularly with the haka in the group stages of the 2003 World Cup. Oh how the television producers purred. Carlos Spencer, leading the haka, kicked things off, with Kees Meeuws looking particularly angry. But then the Tongans enter the fray, the noise rising and clashing, both sides moving closer and closer until the Tongans out-last the haka. Both teams turn away ready to do battle. Now that's pre-match entertainment. Ah, the Welsh again. The men in red probably feature far more in this list than they'd like to but many will be glad not to have earned another entry last weekend as they squeezed home against Fiji in Cardiff. But their recent history against the Fijians didn't make pretty reading going into that game. There was a 16-all autumn international draw in 2010 (they learnt not to play their second team in such fixtures again) but, most notably, was the final nail in the coffin of their 2007 World Cup campaign in Nantes. And what a game it was: 38-34 to the Fijians with the victors advancing to the knockout stages and the Welsh heading back across the channel. You couldn't accuse the Welsh of dying wondering: they threw it about, almost Fijian in style, and out-scored their opponents five tries to four. But Nicky Little, the finest of all Fijian fly-halves, marshalled the game with expertise, kicking 18 points and pinning the Welsh back. They attacked from their own 22, put in huge hits and finished clinically to send the Welsh home. Four years on, in Hamilton, Wales had learnt their lesson. Stung by that draw in Cardiff as much as the loss in Nantes, they dished out retribution with a 66-0 pool stage drubbing in the 2011 World Cup. One of the great pleasures of watching Samoan, Fijian and Tongan families line up with, and sometimes against, one another. When the Islanders play, a set of brothers is likely and cousins almost de rigeur. There's the Samoa and Northampton stars Ken and George Pisi and, of course, the six Tuilagi brothers - Andy, Henry, Alesana and Freddie capped by Samoa, Sanele by Samoa U20s and Manu by England. Various All Blacks with origins in the islands have played against brothers: Charles Piutau's brother Siale turned out for Tonga and former No.8 Rodney So'oialo's brothers Steve and James played for Samoa. But the Pacific Island brotherhood peaked at the 2011 World Cup when the Tagicakibaus - Michael and Sailose - met in front of a packed out Eden Park as Samoa played Fiji in the World Cup Pool Stages. London Irish wing Sailosi, the older of the pair, chose to represent the land of his mother, Samoa, while Michael, then of Saracens chose Fiji, where their father was from. Sailosi came out on top, 27-7, but the real winners were the rest of the Tagicakibau clan, who turned out clad in half-blue, half-white shirts.